The international rally organised on 19 July by Izquierda Revolucionaria and the CWI was a massive success. More than 600 workers, youth and activists from both our organisations and the wider Left, packed the main hall of the Cocheras de Sants. There was an electric atmosphere, in defence of October and revolutionary internationalist Marxism. The comrades who spoke were, by order of intervention: Ana Garcia the general secretary of the Sindicato de Estudiantes, Paul Murphy, Marxist MP in Ireland who has just won an historic victory in defeating an attempt to jail him and others for successfully fighting against water charges (JobstownNotGuilty); Juan Ignacio Ramos general secretary of Izquierda Revolucionaria; Peter Taaffe, a founder of Militant and general secretary of the Socialist Party.and Kshama Sawant, Marxist councillor in Seattle, USA, one of the most important figures on the US Left. IS is difficult to describe the impact of the speakers, who for 2 hours covered a broad scope from the October Revolution to the class struggle today. All of the speakers insisted on the extraordinary legacy of Bolshevism, the ideas of Lenin and Trotsky and the example of tens of thousands of anonymous fighters, which is so important for those who fight for a socialist world today. The banner of the October revolution is for us a guide to action. When the workers and youth of Russia took power, expropriated the capitalists, gave land to the peasants, rights to women and for the self determination of oppressed nations… They showed in deeds and not only in speeches that it really is possible to change reality and bring down capitalism. The victory of October shook the world and inspired workers and youth filling humanity with hope. The idea of socialism left the terrain of theory and became a practical task. This revolution was the most democratic, participative and generous in history. There were also references to the collapse of the USSR and the Stalinist regimes in eastern Europe which gave way to a vicious capitalist counter revolution. The bureaucracy, which abandoned proletarian internationalism for the anti Marxist theory of socialism in one country and destroyed workers democracy to establish an authoritarian state, and crushed and imprisoned Lenins Bolsheviks, betrayed the revolution and became a new capitalist class. All speakers underlined how since ten years ago, world capitalism is living through its worst recession since 1929. The internal equilibrium of the system has been broken: mass unemployment, inequality, wars with thousands of dead and refugees, and the ecological catastrophe is spreading like a plague. Society determines consciousness, as Marx said. The crisis accelerated all the processes of the class struggle and led to an upturn in struggle which is unprecedented in the last 40 years. The consciousness of millions of workers and especially youth has advanced, together with social polarisation. Capitalism has been thrown into a period of uncertainty and pessimism. But the experience of these years has also showed that if we want real change rhetoric and speeches are not enough. The example of Greece is conclusive. Syriza and Tsipras had the backing of the working people. But Tsipras lacked a revolutionary policy, accepted the logic of the capitalist system and capitulated shamelessly to the Troika, applying its cuts and austerity. The class struggle, with its spectacular rises and falls, and the example of how we are building the forces of marxism, shows how it is necessary not only to intervene energetically in the movement but also defend a consequent socialist policy. The words of Kshama Sawant, explaining the work of Marxists in the Seattle council. Leading campaign for 15 dollars an hour, and the big mobilisations which we are building together with others against Trumps reactionary policies. She explained how to use an elected position to raise the level of organisation and consciousness. The same applies to Paul Murphy in the struggle against water charges which provoked a brutal response by the state. The way that the Socialist Party (CWI in Ireland) which carried out a mass campaign against criminalisation of protest, managed to defeat these attacks and achieve the absolution of all defendants. This great triumph shows how Bolshevik methods can face up to reaction with success. Peter Taaffe gave an excellent explanation of the main ideas of Bolshevism, underlining the importance of the existence of a revolutionary party to transform this situation completely. This is the central task of the epoch: building revolutionary parties all over the world, through patient intervention in the class struggle and in the new political phenomena which rise as a consequence of the crisis of the system and of social democracy. The position of the Socialist Party (CWI in England & Wales) calling for a Corbyn government to implement a socialist programme against cuts and austerity, is the only concrete way to move forward and connect with the aspiration of the millions of workers and youth who want to bring town the Tories and transform society. Ana Garcia focussed on the key role of young people in all the events we have seen in Spain. The children of the crisis see that this system has nothing to offer them. They will inherit nothing but the rights our parents and grandparents fought for on the streets, and they have been the spinal column of the social rebellion which has put the PP in check and opened up a big crisis in the post-Transition regime. 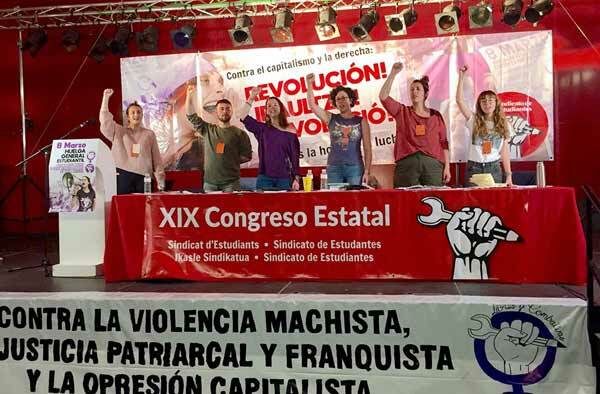 The Sindicato de Estudiantes has played a leading role in this battle, defending a revolutionary, anti-capitalist programme without retreats basing ourselves on the power of the youth. Anaexplained how we have organised 25 general strikes in schools and universities which have emptied the classrooms and filled the streets with a clamour against the government which is the inheritor of Francoism. Millions of youth want a deep and radical change but this change cannot be achieved by respecting the logic of capitalism. This is impossible. We want public free education but we also want health, work and decent housing. We want to end all class, gender and national oppression, and build another world. Se know that this is only possible with a struggle for socialism. This is why the Sindicato de Estudiantes defends the ideas of Marxism and bolshevism. The defence of the right of self-determination in Catalonia was present throughout the meeting, from the opening words of Borja Latorre and especially in the intervention of Juan Ignacio Ramos. For IR, the Catalan people have the right to decide, and this should not be conditional on the state accepting it. This right must be won by mobilisation and mass struggle. We cannot subordinate ourselves to the Catalan bourgeoisie, right wing nationalists like PDeCat, who are champions of cuts and repression. We fight for a Socialist Catalonia, a Socialist Republic, to unite the forces of the workers and youth of Catalonia with those of the rest of the Spanish state, to win real democracy which can only be socialism. A key step in this is bringing down the reactionary governments of Rajoy in Madrid, but also Puigdemont in Catalonia, which we can only achieve by mass struggle breaking with the social peace defended by the union leaders. This great rally commemorated the centenary of the Russian Revolution, but it was also the anniversary of another great revolution: three years of armed struggle against fascism in the streets trenches and factories of Catalonia, the Basque country and all parts of the spanish state. This heroic struggle remains a great inspiration to continue with their struggle to pay homage to the hundreds of thousands assassinated by the dictatorship, who have received no recognition. The rally ended underlining the idea that ran through all speeches. Today, all the objective material conditions exist for socialism. It is not objective conditions which leads to lost opportunities but the lack of a revolutionary leadership. This is our task: contribute to the building of this subjective factor without sectarianism holding out a hand to all who wish to change society. The raly ended after 9pm, with an emotional singing of the Internationale in various languages by more tan 600 people, ending a deeply red and internationalist event.